Did you know it’s National Salad and Vinegar month?! I have always wanted to make my own salad dressings. I have heard it’s the best way to get great flavor but it’s a little intimidating, right? 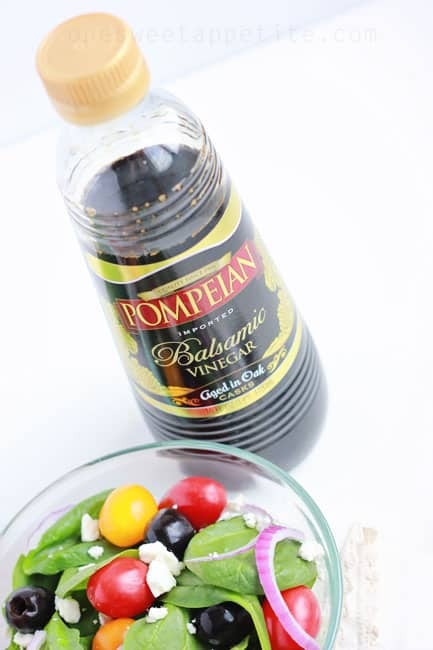 I decided it’s time to nip my fears in the bum and have teamed up with Pompeian to test out a few fun recipes including this super simple balsamic vinaigrette and show you how I’m #DressingItUp! 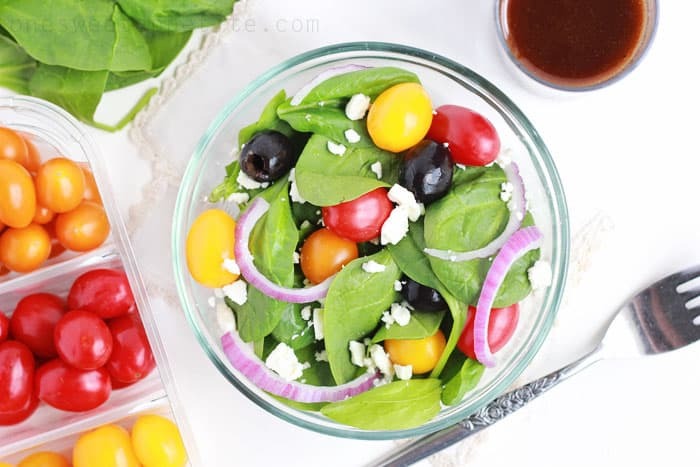 I always seem to have a bottle of Pompeian Balsamic Vinegar in my pantry but had no idea it was a main ingredient in so many of these dressing recipes. The dark color never really screamed “Use me on a salad!” So when I pulled it out to create this dish I was nervous. Fingers crossed that it would turn out… I dived right in! Place all of your ingredients in a jar. Tighten the lid and give it a good shake. 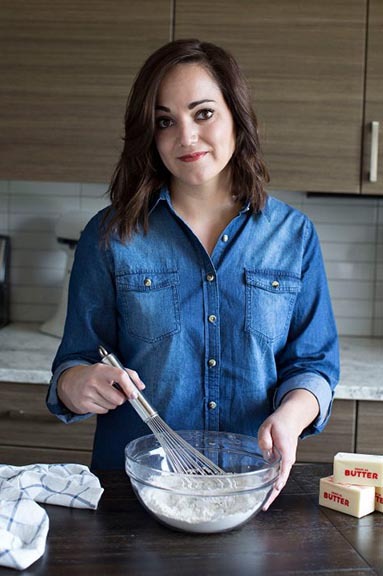 The first thing I noticed about this recipe is how quickly it all came together. Seriously, it only took me five minutes. 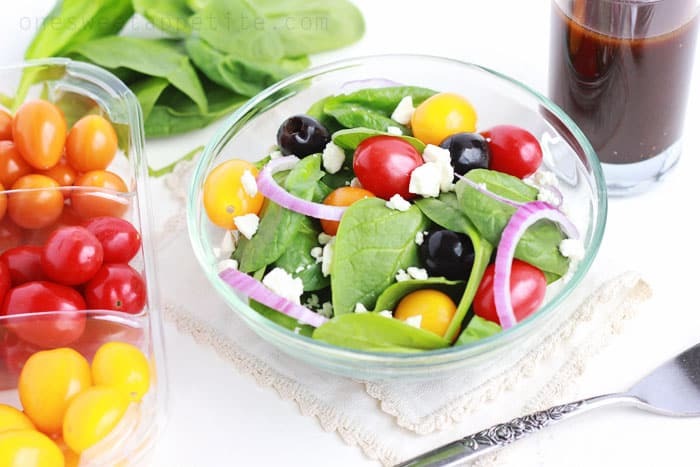 I used some fresh spinach, a variety of cherry tomatoes, olives, sliced red onions, and a little feta to create a fresh Greek type salad. Drizzle a little of that vinaigrette over the veggie packed goodness and enjoy! If you want to make it a meal you can even top this with some grilled chicken. My husband, who is not a salad eater, informed me that this recipe is a keeper. Pompeian won us over with it’s outstanding flavors. Speaking of, I had no idea there was such a large variety! For additional recipe ideas, you can visit the Pompeian website. You can also follow them on their social media channels! Oh my gosh, this looks so good and perfect for a summer meal. I love balsamic! And homemade is the ONLY way to eat it YUM! 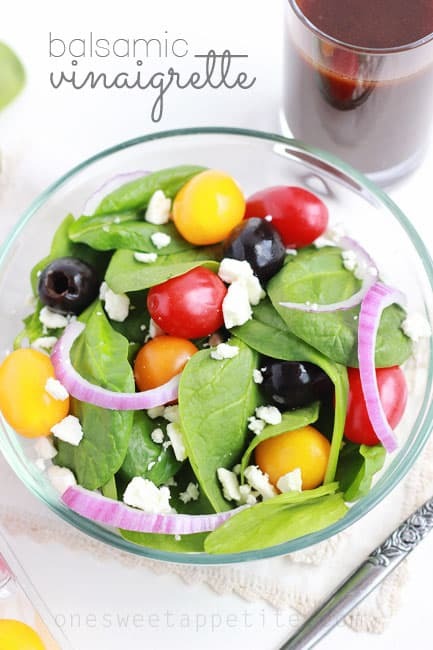 I also love balsamic – this salad looks yummy! Yum! I love simple and delicious! I love balsamic . I also love things I can whip up quickly. Thanks for the recipe. This looks so delicious! 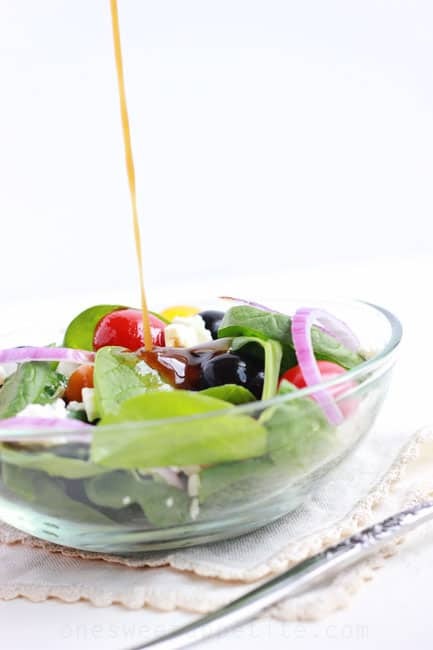 I love a fresh salad.. and I LOVE the shot of the dressing being poured…NAILED IT! This sounds great!! Pinning to try later! This salad looks delicious! My favorite salad is a chinese chicken salad. Mmmm, it’s a good one! This makes my salads loos so boring. This is so fancy!